Give the gift of reading to a child in need. On Valentine’s Day Blake Mini Library donates books to children and youth living in domestic violence, homeless, foster care and runaway youth shelters. The students at Rooftop Alternative PreK-8 School are currently joining Blake Ansari’s efforts to bring the joy of reading to homeless children. Students are helping to fill the rainbow-colored shelves of the Blake Mini Library at Hamilton Families in San Francisco. Book donations will be received by The Studios at Rooftop School’s Burnett & Mayeda Campuses, starting from MLK, Jr. Day of Service through Valentine’s Day, when the books will be delivered to Hamilton Families in the Tenderloin. Please consider donating your new and recently new books (no cloth books, please) to children from birth to age 21. With the 2016 Valentine’s Day Blake Mini Library book drive, Rooftop School invited book donors to include a Note of Encouragement, a special surprise message hidden inside the book to be discovered by a future reader. The reading and writing of these notes helped create a special bond between two people who might never ever meet — the donor and the recipient. The Notes of Encouragement added an element of surprise and delight, while conveying positive thoughts of love, hope and gratitude. As a child who loves to read, Blake Ansari wanted to make sure that the homeless children had access to books. At the age of six, Blake began his youth philanthropy effort by donating 600 books to the PATH emergency family shelter in the Bronx in 2014. On Valentine’s Day 2015, seven-year old Blake donated over 5,000 books along with a four ft. tall rainbow colored Blake Mini Library to children who are homeless living at Women In Need Glenwood Shelter in Brooklyn, New York. In 2016, Hamilton Families, San Francisco and Riverside Church Food Pantry, New York City were recipients of Blake Mini Library. This year, Leake & Watts Mother & Child Foster Care is the 2017 recipient of a Blake Mini LIbrary. December 2013, at the age of six, Blake Ansari decided to help end poverty by donating a Blake Mini Library to homeless shelters and food banks. Blake Mini Library supports the reading, writing and science literacy of children ages birth to 21 living in homes for runaways, homeless shelters and foster care. On Valentine’s Day 2015, Blake Mini Library donated 6,000 books to Women in Need, Inc., Brooklyn, New York. This 2016 Valentine’s Day recipients of Blake Mini Library are Hamilton Family Center, San Francisco and Riverside Church Food Pantry, New York City. This year, Susty Kids, Inc. joins Blake Mini Library to help improve the literacy of homeless children in San Francisco. Our Coast-to-Coast Blake Mini Library book drive officially begins on Monday, January 18, Martin Luther King Jr. Day of Service. Please join us by donating new and recently new books (no cloth books) to children from birth to age 21. Give children who are homeless a Blake Mini Library. Like and Share Susty Kids, Inc. and Blake Mini Library book drive successes on Facebook. The rising cost of living and stagnant wages of New York City has resulted in The City having the highest number of children in America living in homeless shelters. Forty percent of shelter residents are children. In San Francisco, the technology boom has displaced working-families for high income young professionals. San Francisco has the second highest rate of homeless children in the nation. Thirty percent of San Francisco’s homeless are children. Opening Doors, updated and amended in 2015, is the nation’s first comprehensive Federal strategy to prevent and end homelessness. Goals include preventing and ending homelessness for families with children and youth in 2020. Following up on the October 8th Bread & Puppet cantastoria workshop for San Francisco Unified School District, Clare Dolan kindly shares the following examples of International and American Cantastoria. Clare is the co-creator and festival curator for Banners & Cranks, an annual festival of cantastoria performance by artists and musicians from all over the United States, and the Chief Operating Philosopher of the fascinating Museum of Every Day Life in Glover, Vermont, whose goal is to explore, analyze and celebrate everyday life objects. 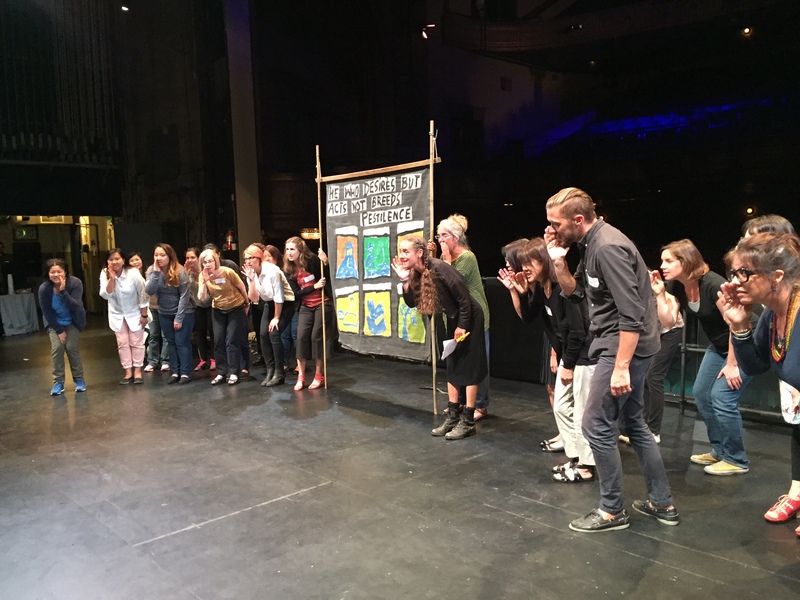 On Thursday, October 8, 2015, from 4pm-6pm, San Francisco Unified School District Visual and Performing Arts Department Elementary/K-8 and Secondary Arts Coordinators gathered on the stage of the Curran Theater for a Cantastoria Workshop, led by Clare Dolan and members of the 2015 West Coast touring company of Bread and Puppet Theater. The workshop participants were welcomed to The Curran: Under Construction by Carole Shorenstein Hays, Greg Backstrom and Brian Farley. Andi Wong of Rooftop Alternative School spoke on the theme of “Inspiration,” having received a healthy dose of wonder at the Bread and Puppet Farm in Glover, Vermont, in advance of the troupe’s Bay Area visit. SFUSD Arts Education Master Plan Implementation Manager Antigone Trimis drew connections to student learning, school site culture and climate. After an introductory slide show about Bread and Puppet Theater and cantastoria by Clare Dolan, the art coordinators gathered on the stage of the historic theater to learn by doing. Cantastoria is one of the oldest performance forms known to humans, originating in India more than two thousand years ago. It typically involved one or two performers, often performing on the street, and a multi-image scroll or a series of paintings mounted together at the top. Bread & Puppet Theater’s version of Cantastoria is usually performed with a narrator who points at the pictures and one or two “choruses” who respond to the narration. The subject of the cantastoria can be anything and directed to any age audience. Clare Dolan and Bread and Puppet performers Esteli Kitchen, Joshua Krugman,Kali Therrien, Luis Gabriel Sanabria, MJ Hicks, and Tom Cunningham guided participants through the creation, narration and choral performing of this ancient art form. • Clare Dolan answers the question: What is cantastoria?